The effect of adequate glycemic control on the progression of micro-vascular and macro-vascular complications have been well described by the Diabetes Control and Complications Trial (DCCT)  and the United Kingdom Prospective Diabetes Study (UKPDS)  trials. The concept of adequate glycemic control and minimum glycemic variability requires an ideal, accurate and reliable glucose monitoring system. This quest to achieve an adequate glycemic control has led to the development of science of blood glucose monitoring systems. To achieve minimum glycemic variability the technique of CGMS was developed making the dream of artificial pancreas a much possible realty. In 1968, Rahbar first showed that hemoglobin A1 represented a glycated form of hemoglobin which was increased in diabetes. HBA1c measures a physiologic process of non-enzymatic glycation, which is a surrogate for glycation of other proteins in the body and a precursor of diabetes complications. Therefore, the HBA1c represents a measurable indirect estimate of complications of diabetes. It gives an average estimate of plasma glucose over the preceding three months (equal to the lifespan of red blood cells). However, 50% contribution is of the last one month. Monnier et al., have described an important concept of relative contributions of the fasting and the post-prandial blood glucose levels to the HBA1c. For HBA1c less than 8.4% is the post-prandial glucose values, which are more contributory and as the HBA1c increases, the relative contribution of fasting plasma glucose values increases. The Diabetes Control and Complications Trial (DCCT)  and UK Prospective Diabetes Study (UKPDS),  both long-term studies had HBA1c as the primary index of glycemic control. Since then, utility of HBA1c has been well validated as an end point in therapeutic diabetes trials. HBA1c is assay dependent and hence to achieve reliability the assays have to be certified by NGSP (National Glycosylation Standardisation Program). Without standardization, reported results between laboratories may not be comparable, even if both laboratories use the same assay method. An important limitation is that it does not depict the short-term glycemic variability and hence is of no value for acute or short-term decision making. Hence it may not be suitable in cases where adequate glycemic control has to be achieved and maintained in a short time like gestational diabetes mellitus. Perform quarterly in patients whose therapy has changed or who are not meeting glycemic goals. Measurement of glycated serum proteins (fructosamine) depicts relatively short-term changes (1-2 weeks) in glycemic status. Hence they may be utilised in certain situations like gestational diabetes or in those where HBA1c is unreliable. However, further studies are needed to determine if the test provides useful clinical information in these situations. Unlike the HBA1c, fructosamine assay has not yet been validated with progression of diabetes complications. Self-monitored blood glucose is the easiest and the most widely used method of short-term glucose monitoring throughout the world. Fingerstick glucose testing using a glucometer is the prototype of SMBG. These points of care devices have revolutionized the concept of home-based glucose monitoring. It has been 40 years since Anton Clemens at Ames research Division, Indiana USA developed the first glucose meter which combined dry chemistry test strips with reflectance photometry to measure blood glucose. Presently there are a variety of glucose meters available in the market; however, clinicians and patients should be aware of the features as well as the disadvantages of each one of them. Glucometers can be broadly classified into two types depending on the enzymes used: Glucose oxidase and glucose dehydrogenase (GDH) with various cofactors like (FAD/NAD/Pyrroloquinoline). Each of these types has their own advantages and disadvantages. Enzymatic reactions convert glucose into either electrons or free radicals like hydrogen peroxide which are then measured either by an electrode (amperometric method) or by colorimetric reaction (photometric). Modern glucometers work on biosensor technology and require small sample size as low as 0.3 μl of blood as compared to the 50 μl of blood used in the earlier obsolete glucometers. Ideally sides of the fingers of the hands are to be used for SMBG and only a single lancet prick to be used. Accuracy of SMBG depends on the reliability and accuracy of the glucometers. The errors are classified as pre-analytical, analytical and post-analytical errors. A simple example of pre-analytical error is not washing ones hands before glucose testing. Analytical errors can be traced to instrument errors like use of GDH POQ enzyme glucometers and their interference with maltose as explained earlier which resulted in overestimation. Post-analytical errors involve erroneous use of the data provided in terms of therapy. In lieu of these errors, accuracy is always a concern when using glucometers. The ISO: 15197 standards discuss quality standards in blood glucose monitoring devices and the accuracy requirements for glucometers. This standard states that 95% of comparative results between a laboratory reference and the glucometer must fall within a bias of 15% for results greater than 100 mg%. Total of 99% of the results should fall in Zone A of the Parkes Error grid. The rationale is that this permissible error would not cause significant deviations during therapeutic decision making. [Figure 1]. Cochrane analysis of the utility of SMBG in non-insulin treated diabetes population concluded that when diabetes duration is over one year, the overall effect of SMBG on glycemic control in this group is limited only up to six months after initiation and subsides after 12 months. There is no evidence that SMBG affects patient satisfaction and general health-related quality of life. More research is required to explore the psychological impact as well as the impact of on hypoglycemia and diabetic complications. A review by Kolb et al. published in 2010 also shows that the evidence base for better outcome with use of SMBG is insufficient with regard to results from RCTs, for all three diabetes types: Type 1, Type 2 and gestational diabetes. The consensus for this group still remains elusive. In non-insulin treated type-2 diabetes patients also SMBG is useful but is not clearly defined by ADA 2013. The principle of CGMS is based on the continuous measurement of interstitial glucose levels. Hence it has the ability to provide information about the direction, magnitude, duration, frequency of fluctuations in blood glucose levels. It is an effective tool to measure the glycemic variability and glycemic excursions. There are two main types of CGMS devices: Retrospective also called as 'Professional CGMS' and 'Real time or Personal CGMS'. The Retrospective CGMS gives a retrospective data of 3-5 days depending on the duration of use. It records readings every 5 minutes giving about 288 readings every day. The recorded data is downloaded in the physician's office and hence this type of CGMS does not give us real-time values and cannot be linked with an insulin pump. On the contrary, Real time CGMS gives continuous real time results and has built-in alarm system which provides warnings in rapid fluctuations of blood glucose. The monitor shows trends and predicts future glucose readings. The real time readings help in immediate feed-back and appropriate therapeutic action and can be linked to an insulin pump. Every CGMS device has a sensor which measures interstitial fluid glucose levels and is inserted using an inserter. The real-time CGMS has a monitor which displays the glucose readings and predicts future trends. In case of retrospective CGMS other components include a docking site which helps download the data from the sensor. Murphy et al., showed that CGMS with routine ante-natal care resulted in better glycemic control and reduced risk of macrosomia. Further studies are required for validation of CGMS in pregnancy. Non-invasive glucose monitoring forms the future of glucose monitoring systems. Raman spectroscopy, optical coherence tomography, photo-acoustic spectroscopy and fluorescence show the greatest promise in achieving the goal of an ideal glucose sensor. However, at present none of these devices meet the criteria for the ideal sensor and an ideal/accurate biosensor of a closed-loop system remains elusive. Concept of artificial pancreas: Closing the loop? CGMS connected to continuous insulin infusion systems in a closed loop forms the basic structure of an artificial pancreas. Thus CGMS forms the key link towards realization of the unrealistic dream of artificial pancreas. To summarise, the options of glucose monitoring are varied and each option has its own merits and flaws. We have to bear in mind that at the end of the day the goal of adequate glycemic control has to be achieved in every diabetic patient with minimum hypoglycemia and with utilization of available resources of monitoring. 1. The effect of intensive treatment of diabetes on the development and progression of long-term complications in insulin-dependent diabetes mellitus. The Diabetes Control and Complications Trial Research Group. N Engl J Med 1993;329:977-86. 2. Intensive blood glucose control with sulphonylureas or insulin compared with conventional treatment and risk of complications in type 2 diabetes (UKPDS33). United Kingdom Prospective Diabetes study (UKPDS) group. Lancet 1998;352:837-53. 3. Monnier L, Mas E, Ginet C, Michel F, Villon L, Cristol JP, et al. Activation of oxidative stress by acute glucose fluctuations compared with sustained chronic hyperglycemia in patients with type 2 diabetes. JAMA 2006;295:1681-7. 4. Rahbar S. An abnormal haemoglobin in red cells of diabetics. Clin Chem Acta 1968;22:296-8. 5. Kowalski AJ, Dutta S. It's time to move from the A1c to better metrics for diabetes control. Diabetes Technol Ther 2013;15:194-6. 6. Monnier L, Lapinski H, Colette C. Contributions of fasting and post-prandial plasma glucose increments to the overall diurnal hyperglycemia of type 2 diabetic patients. Diabetes Care 2003;26:881-5. 7. Nathan DM, Kuenen J, Borg R, Zheng H, Schoenfeld D, Heine RJ, A1c-Derived Average Glucose Study Group. Translating the A1C assay into estimated average glucose values. Diabetes Care 2008;31:1473-8. 8. The International Expert Committee. International Expert Committee report on the role of the A1C assay in the diagnosis of diabetes. Diabetes Care 2009;32:1327-34. 9. Little RR. Glycated hemoglobin standardization--National Glycohemoglobin Standardization Program (NGSP) perspective. Clin Chem Lab Med 2003;41:1191-8. 10. American Diabetes Association. Standards of Medical Care in Diabetes--2013 Diabetes Care. 2013;36 Suppl 1:11-S66. 11. Kumar PR, Bhansali A, Ravikiran M, Bhansali S, Dutta P, Thakur JS, et al. Utility of glycated haemoglobin in diagnosing type 2 diabetes mellitus: A community-based study. J Clin Endocrinol Metab 2010;95:2832-5. 12. Mohan V, Vijayachandrika V, Gokulakrishnan K, Anjana RM, Ganesan A, Weber MB, et al. A1C cut points to define various glucose intolerance groups in Asian Indians. Diabetes Care 2010;33:515-9. 13. Saudek CD, Brick JC. The clinical use of hemoglobin A1c. J Diabetes Sci Technol 2009;3:629-34. 14. Bode BW, Irvin BR, Pierce JA, Allen M, Clark AL. Advances in hemoglobin A1c point of care technology. J Diabetes Sci Technol 2007;1:405-11. 15. Al-Ansary L, Farmer A, Hirst J, Roberts N, Glasziou P, Perera R, et al. Point-of-care testing for Hb A1c in the management of diabetes: A systematic review and metaanalysis. Clin Chem 2011;57:568-76. 16. Handelsman Y, Mechanick JI, Blonde L, Grunberger G, Bloomgarden ZT, Bray GA, et al. AACE Task Force for Developing a Diabetes Comprehensive Care Plan. American Association of Clinical Endocrinologists Medical Guidelines for clinical practice for developing a diabetes mellitus comprehensive care plan: Executive summary. Endocr Pract 2011;17:287-302. 17. Lindsey CC, Carter AW, Mangum S, Greene D, Richardson A, Brown SJ, et al. A prospective, randomized, multicentered controlled trial to compare the annual glycemic and quality outcomes of patients with diabetes mellitus monitored with weekly fructosamine testing versus usual care. Diabetes Technol Ther 2004;6:370-7. 18. Dungan KM. 1,5-anhydroglucitol (GlycoMark) as a marker of short-term glycemic control and glycemic excursions. Expert Rev Mol Diagn 2008;8:9-19. 19. Clarke SF, Foster JR. A history of blood glucose meters and their role in self-monitoring of diabetes mellitus. Br J Biomed Sci 2012;69:83-93. 20. Rebel A, Rice MA, Fahy BG. Accuracy of point-of-care glucose measurements. Diabetes Sci Technol 2012;6:396-411. 21. U.S. Food and Drug administration: FDA public health notification: Potentiallty fatal errors with GDH-POQ glucose monitoring technology August 13, 2009. 22. Schnell O, Alawi H, Battelino T, Ceriello A, Diem P, Felton A, et al. Addressing schemes of self-monitoring of blood glucose in type 2 diabetes: A European perspective and expert recommendation. Diabetes Technol Ther 2011;13:959-65. 23. Fedele D, Corsi A, Noacco C, Prisco F, Squatrito S, Torre E, et al. Alternative site blood glucose testing: A multicenter study. Diabetes Technol Ther 2003;5:983-9. 24. Freckmann G, Schmid C, Baumstark A, Pleus S, Link M, Haug C. System accuracy evaluation of 43 blood glucose monitoring systems for self-monitoring of blood glucose according to DIN EN ISO 15197. J Diabetes Sci Technol 2012;6:1060-75. 25. Parkes JL, Slatin SL, Pardo S, Ginsberg BH. A new consensus error grid to evaluate the clinical significance of inaccuracies in the measurement of blood glucose. Diabetes Care 2000;23:1143-8. 26. Strowig SM, Raskin P. Improved glycemic control in intensively treated type 1 diabetic patients using blood glucose meters with storage capability and computer-assisted data analyses. Diabetes Care 1998;21:1694-8. 27. National Institute for Clinical Excellence. Type 1 diabetes: Diagnosis and management of type 1 diabetes in adults. CG15 2004. 28. Burge MR. Lack of compliance with home blood glucose monitoring predicts hospitalization in diabetes. Diabetes Care 2001;24:1502-3. 29. Farmer AJ, Wade AN, French DP, Simon J, Yudkin P, Gray A, et al., DiGEM Trial Group. Blood glucose self monitoring in type 2 diabetes: A randomised controlled trial. Health Technol Assess 2009;13:iii-iv, ix-xi, 1-50. 30. Fisher L, Polonsky W, Parkin CG, Jelsovsky Z, Amstutz L, Wagner RS. The impact of blood glucose monitoring on depression and distress in insulin-naïve patients with type 2 diabetes. Curr Med Res Opin 2011;27 Suppl 3:39-46. 31. Malanda UL, Welschen LM, Riphagen II, Dekker JM, Nijpels G, Bot SD. Self-monitoring of blood glucose in patients with type 2 diabetes mellitus who are not using insulin. Cochrane Database Syst Rev 2012;1:CD005060. 32. Kolb H, Kempf K, Martin S, Stumvoll M, Landgraf R. On what evidence-base do we recommend self-monitoring of blood glucose? Diabetes Res Clin Pract 2010;87:150-6. 33. Louie RF, Lau MJ, Lee JH, Tang ZM, Kost GJ. Multicenter study of the prevalence of blood contamination on point-of-care glucose meters and recommendations for controlling contamination. Point Care J Near Patient Test Technol 2005;4:158-63. 34. Centers for Disease Control and Prevention. Notes from the Field: Deaths from Acute Hepatitis B Virus Infection Associated with Assisted Blood Glucose Monitoring in an Assisted-Living Facility - North Carolina, August-October 2010. MMWR 2011;60:182. 35. Kim HS, Shin JA, Chang JS, Cho JH, Son HY, Yoon KH. Continuous glucose monitoring: Current clinical use. Diabetes Metab Res Rev 2012;28 Suppl 2:73-8. 36. DeSalvo D, Buckingham B. Continuous glucose monitoring: Current use and future directions. Curr Diab Rep 2013;13:657-62. 37. Juvenile Diabetes Research Foundation Continuous Glucose Monitoring Study Group, Tamborlane WV, Beck RW, Bode BW, Buckingham B, Chase HP, Clemons R, et al. Continuous glucose monitoring and type 1 Diabetes. N Engl J Med 2008;359:1464-76. 38. Deiss D, Bolinder J, Riveline JP, Battelino T, Bosi E, Tubiana-Rufi N, et al. Improved glycemic control in poorly controlled patients with type 1 diabetes using real-time continuous glucose monitoring. Diabetes Care 2006;29:2730-2. 39. Bergenstal RM, Tamborlane WV, Ahmann A, Buse JB, Dailey G, Davis SN, et al. STAR 3 Study Group. Effectiveness of sensor-augmented insulin-pump therapy in type 1 diabetes. N Engl J Med 2010;363:311-20. 40. Murphy HR, Rayman G, Lewis K, Kelly S, Johal B, Duffield K, et al. Effectiveness of continuous glucose monitoring in pregnant women with diabetes: Randomised clinical trial. BMJ 2008;337:A1680. 41. Poolsup N, Suksomboon N, Kyaw AM. Systematic review and meta-analysis of the effectiveness of continuous glucose monitoring (CGM) on glucose control in diabetes Diabetol Metab Syndr 2013;5:39. 42. Rebrin K, Sheppard NF Jr, Steil GM. 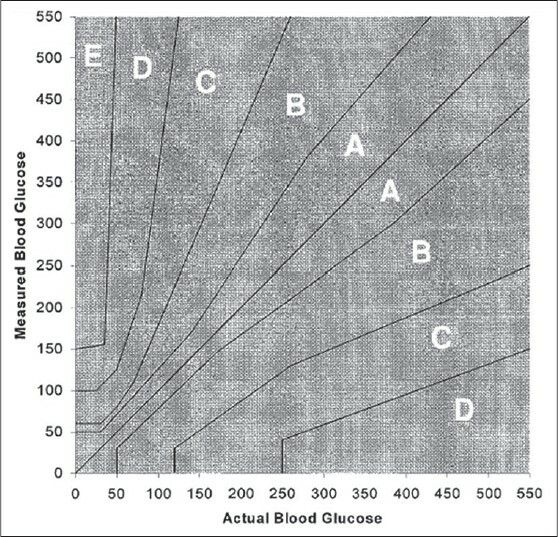 Use of subcutaneous interstitial fluid glucose to estimate blood glucose: Revisiting delay and sensor offset. J Diabetes Sci Technol 2010;4:1087-98. 43. Kordonouri O, Pankowska E, Kami B, Kapellen T, Coutant R, Hartmann R, et al. Sensor-augmented pump therapy from the diagnosis of childhood type 1 diabetes: Results of the Paediatric Onset Study (ONSET) after 12 months of treatment. Diabetologia 2010;53:2487-95. 44. Buchanan TA, Kjos SL. Counterpoint: Glucose monitoring in gestational diabetes: Lots of heat, not much light. Diabetes Care 2003;26:948-9. 45. Hawkins JS. Glucose monitoring during pregnancy. Curr Diab Rep 2010;10:229-34. 46. Jovanovic L, Savas H, Mehta M, Trujillo A, Pettitt DJ. Frequent monitoring of A1C during pregnancy as a treatment tool to guide therapy. Diabetes Care 2011;34:53-4. 47. Oliver NS, Toumazou C, Cass AE, Johnston DG. Glucose sensors: A review of current and emerging technology. Diabet Med 2009;26:197-210. 48. Weinstock R. Closing the loop: Another step forward. Diabetes Care 2011;34:2136-7.